The patches were used in the field and tested for quality and durability over the years by all of our customers. It started with a friend in the military and amazing airsoft friends, and has grown to include agents and officers in the FBI, CIA, Customs and Border Patrol as well as POLICE and SWAT teams all over the world. During this time, we made many changes to our patch making process to ultimately produce the best quality and handcrafted patch that money can buy. Over the years we have kept up with the various camos and backgrounds used by military and law enforcement and created an large variety of backgrounds to serve as the base for your patch design. In doing this we have kept up with matching the proper thread colors so your patches look great. We started off with a single needle embroidery machine. That machine was fun, but certainly didn't produce many patches. We moved up to a 6 needle brother machine and still needed more. We bought a 15 needle Barudan workhorse and then a twin 6 needle machine, and finally a 12 needle Happy machine (yes, thats the name of the company). We now have a total of 39 needles between 4 machines to quickly stitch out all of our patches. 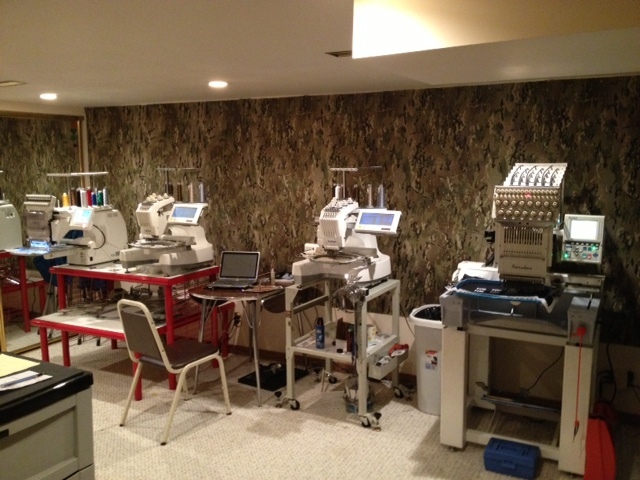 All of our embroidery machines are industrial machines built strong and made to be workhorses. There you have it! This is the brief background on OMLPATCHES. We are a very dedicated bunch who all work long hours, seven days a week to produce high quality custom patches that you can proudly show off for years to come. We call that "patch envy". Go on and create your masterpiece today or select one of our hundreds of stock designs and add your own customization the colors and backgrounds. Truly custom patches at OML Patches, the place for custom patches. Patching the world one team at a time!